As meteorologists, we know the models are going to be wrong. The trick, the “art” is to identify the weather model that is LESS WRONG under specific conditions. 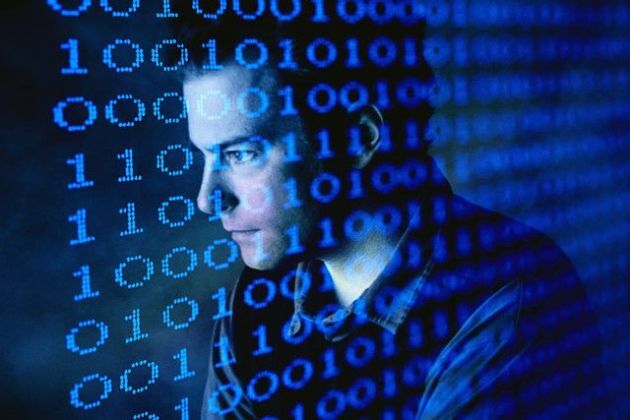 My team looks at as many models as possible before reaching a consensus. It’s great when the models agree (our confidence levels go up) but that rarely happens in real life. When it rains – it pours, and that certainly applies to the current pattern. Tropical Storm Olivia will hit Hawaii today, Tropical Storm Isaac is pushing into the Caribbean, but the big story (I suspect for the next few weeks) is “Florence”. We tend to favor ECMWF (European) guidance, especially with tropical systems. 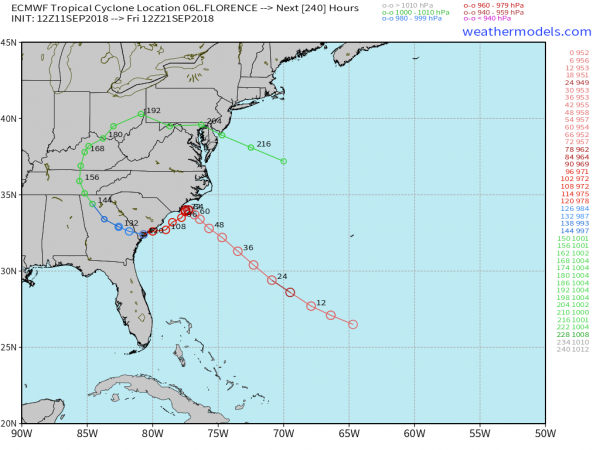 Yesterday’s run suggests a slight southward shift in the track, which may threaten Myrtle Beach and Charleston, with flooding rains for Atlanta and Nashville days after landfall. It’s ‘Beauty and the Beast’ in the weather department – our streak of sunny 80s spills into the weekend, when a few stray T-showers may pop up on radar, but most of us won’t get wet until a real cool front shows up next Tuesday. Still Lukewarm. We’ll have a temperature correction next week (60s and low 70s) but the 2-week GFS forecast still looks fairly mild for most of the USA, downright hot over the southwestern states. Hurricane Florence remains a MAJOR Category 4 hurricane that will bring life-threatening and catastrophic impact to the Mid-Atlantic U.S. The latest track still shows a landfall risk along the Carolina coasts. Florence is expected to make landfall as a MAJOR hurricane Friday. Latest model runs are adding some uncertainty to Florence’s path, which is why it’s important to recognize that anyone in the forecast cone needs to be prepared for the worst. Last minute track changes in a hurricane are not uncommon and a lot can change in the next 24-48 hours, which is why it’s important to keep monitoring the updates and stay alert. 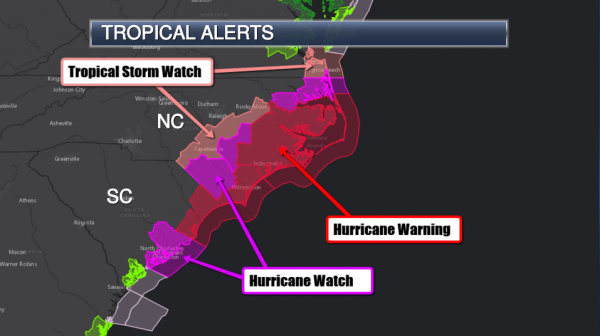 Update on watches and warnings: Hurricane Warnings have now been issued for South Carolina and North Carolina. 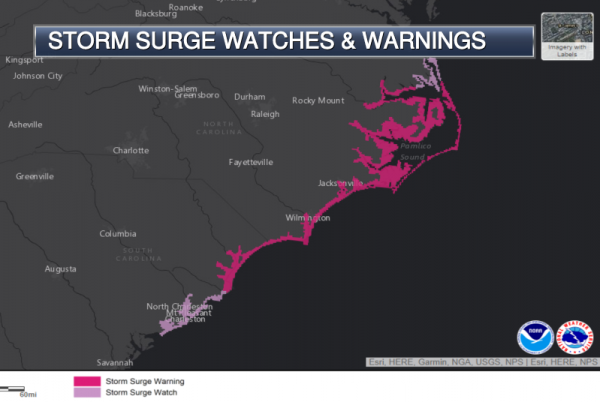 Tropical Storm Watches have now been issued in Virginia with Storm Surge Warnings in effect from South Carolina to North Carolina along the coast. Mandatory evacuations for entire South and North Carolina coasts and “Zone A” in Virginia. More than 1 million people ordered to evacuate ahead of Hurricane Florence. State of Emergency declared for the Carolinas, Virginia, Maryland, and DC. 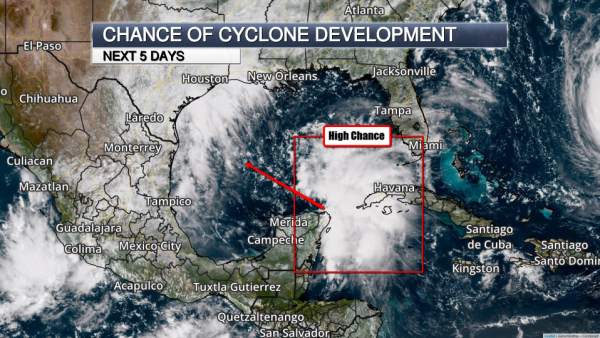 A tropical wave entering the Gulf of Mexico from the Yucatan is showing signs of organization and has a 70% chance of cyclone formation in the next 5 days. A tropical depression is likely to form by Thursday night. Locations in Texas and Louisiana will need to monitor the development of this system. Tropical Storm Isaac continues its western track and will struggle to intensify. Regardless, a Hurricane Watch is in effect for Guadeloupe, Martinique, and Dominica. A Tropical Storm Watch is in effect for Antigua, Montserrat, and St. Kitts and Nevis. Tropical Storm Olivia is speeding up and closing in on the Hawaiian islands with increasing winds and showers beginning to impact the area. 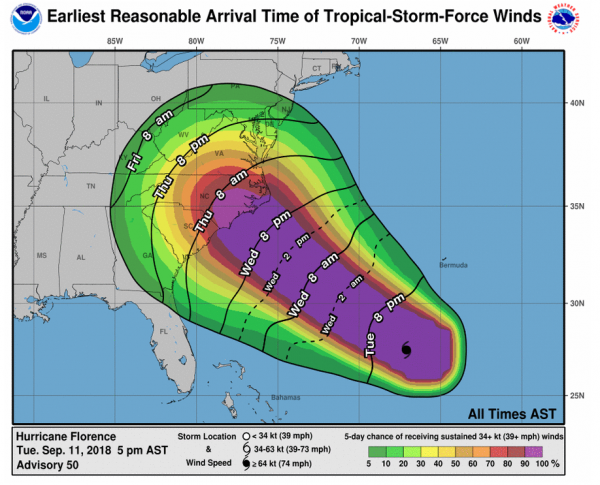 Hurricane Florence Tuesday Afternoon Update. Hurricane Florence underwent a full eyewall replacement cycle but still remains a very steady, powerful hurricane. In fact, the latest update shows slight strengthening. The 5 PM update keeps Florence as a strong Category 4 with maximum sustained winds of 140 mph and WNW movement at 17 mph. The NHC has not made any significant changes to the forecast track for now. During the next 24 hours, Florence will remain in a very favorable environment which gives rise to concerns with further strengthening. It is imperative to understand the MASSIVE size of Hurricane Florence. This is a hurricane that is several states wide. Its impact will be far and wide with hurricane-force winds extending 60 miles out from the center and tropical storm conditions extending 150 miles. This is NOT a small hurricane. Florence Track. 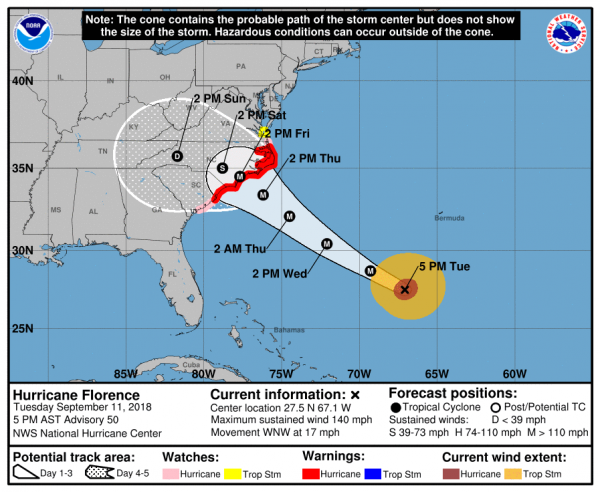 There is little change in the NHC’s latest forecast track for Hurricane Florence. West-northwest/north-west movement is expected to continue through early Thursday with a significant decrease in speed Thursday night into Friday. Weather conditions will deteriorate rapidly Thursday for Mid-Atlantic coast–especially in the Carolinas. Further strengthening is expected through tomorrow with some weakening occurring Thursday. Regardless, Florence is projected to make landfall as a major hurricane with catastrophic and life-threatening impacts to the Mid-Atlantic coasts. Map: NOAA NHC. Day 3 to 5 Uncertainties. Weak steering currents through the weekend are making this forecast challenging as Florence approaches land. The afternoon run of the European model, notorious for its Sandy forecast, is showcasing an interesting turn of events with the hurricane’s track. The model above shows stalling off the coast of the Carolinas with a southern track before working into South Carolina/Georgia. It must be mentioned that this is NOT an official forecast track, but rather one of many models analyzing the hurricane. However, it is worth mentioning as it showcases the possibility of changes in the track and the uncertainties that still exist. This is why no one in the general path of the storm can rest easy. This particular model run would be a worst-case scenario for flooding and storm surge in the Carolinas. Map: weathermodels.com. Florence Timing. 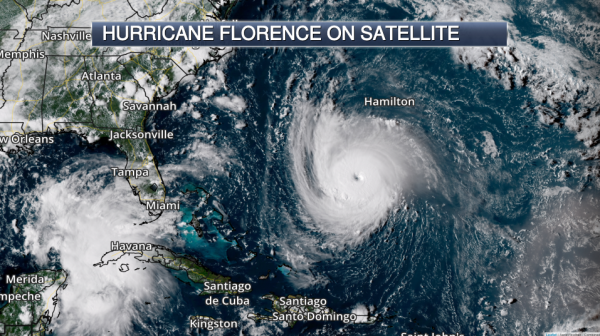 Florence is a very large hurricane with hurricane and tropical storm conditions extending well beyond the eye. Weather conditions will rapidly deteriorate in the Mid-Atlantic late Wednesday/Thursday with the outer bands beginning to affect the region. Tropical storm conditions will begin as early as Wednesday night for the Carolina coasts. A Hurricane Warning means that hurricane conditions are expected somewhere within the warning area. A warning is typically issued 36 hours before the anticipated first occurrence of tropical-storm-force winds, conditions that make outside preparations difficult or dangerous. 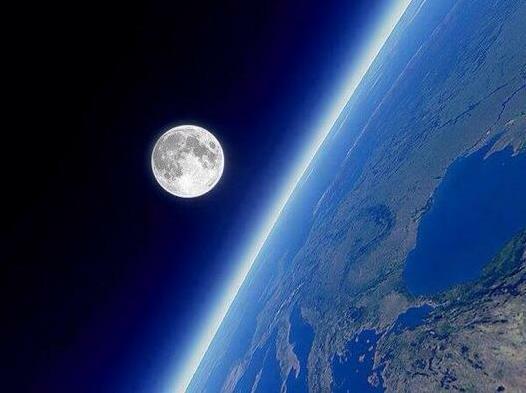 Preparations to protect life and property should be rushed to completion. A Hurricane Watch means that hurricane conditions are possible within the watch area. A watch is typically issued 48 hours before the anticipated first occurrence of tropical-storm-force winds, conditions that make outside preparations difficult or dangerous. A Tropical Storm Watch means that tropical storm conditions are possible within the watch area, generally within 48 hours. Florence Storm Surge. The combination of a dangerous storm surge and the timing of the tide will result in rapidly rising waters along the coast. As Florence approaches, walls of water will back build into the sounds of the Mid-Atlantic resulting in dangerous flooding. 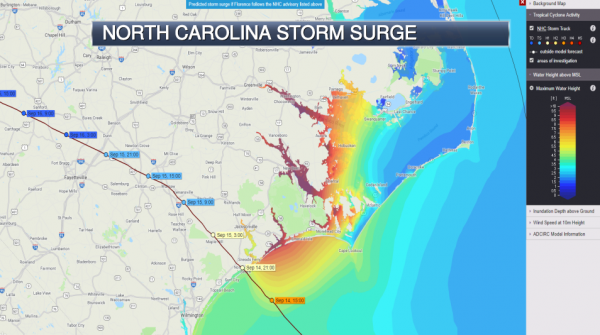 With the anticipated slowing of Florence as it makes landfall, the storm surge is considered to be one of the most dangerous aspects of this hurricane with life-threatening conditions expected. The worse flooding will occur along the immediate coast where onshore winds are occurring. Large, destructive waves are expected. Florence Flood Threat. 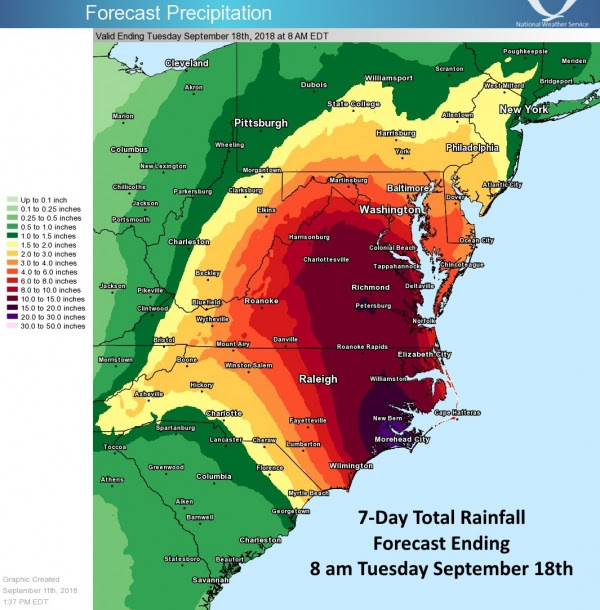 Hurricane Florence will bring torrential downpours to the Mid-Atlantic region. Note that the slow progression of the storm, once it approaches land, could easily result in catastrophic flash flooding and significant river flooding throughout the Mid-Atlantic. This impact will linger into early next week. A general total of 15 to 25 inches of rain will be possible with isolated higher amounts up to 35 inches expected. This would mean a half a year’s worth of rain (or more) in just a matter of days for the area. Florence Preparations. 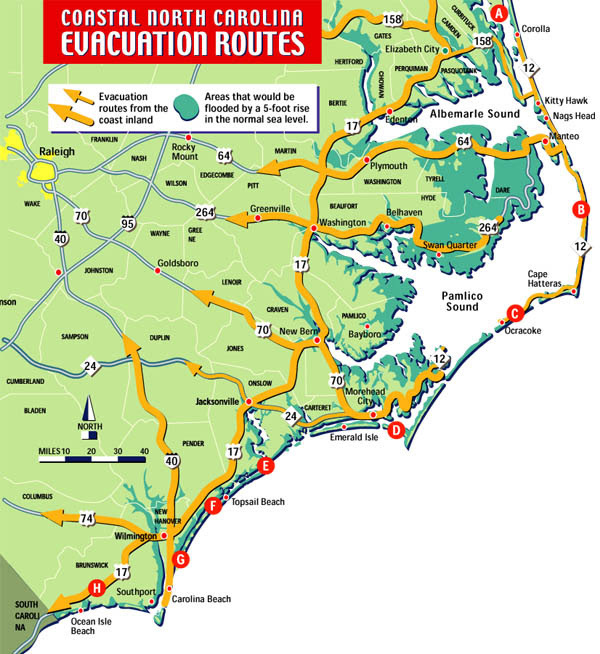 Mandatory evacuations have been ordered for the entire coasts of North and South Carolina today. According to FEMA, more than a million people are under mandatory evacuations with many others urged to evacuate voluntarily. The U.S. Coast Guard will be shutting down ports in Wilmington and Morehead City in North Carolina on Wednesday. Governor Ralph Northam has ordered mandatory evacuations for the lowest-lying areas of coastal Virginia the eastern shore as of 8 AM today. A State of Emergency has been issued for South Carolina, North Carolina, Virginia, Washington DC, and Maryland. Officials urge everyone in the affected areas to prepare for Florence and specifically mentioned preparing for power outages that could last days and possibly weeks. Hurricane Isaac. Isaac is having a difficult time staying organized in a high-shear environment but remains a tropical storm as of the 5 PM NHC update. A westward track is expected, though strengthening is not likely at this time. Confidence is fairly high on the general track of this storm and little changes are expected with future updates. 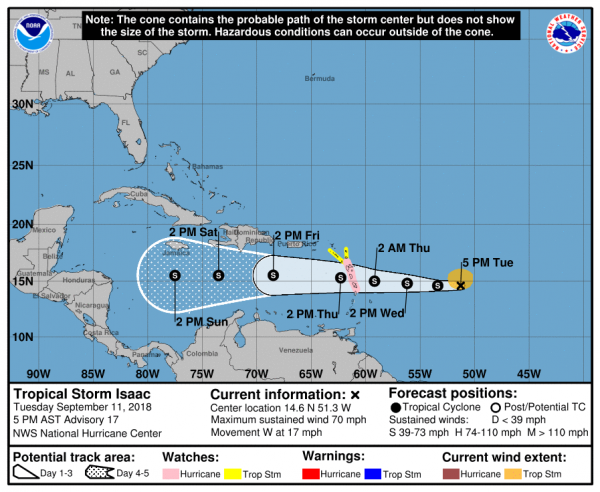 Isaac will be at or near hurricane intensity as it approaches the Lesser Antilles on Thursday. Cyclone Formation Likely in the Gulf of Mexico. As if we didn’t have enough to talk about, the NHC has increased the likelihood of a tropical cyclone forming in the Gulf of Mexico this week. A tropical wave near the Yucatan has a 70% of cyclone formation and will likely become a tropical depression by Thursday night as it tracks into the Gulf. Locations from Northeastern Mexico to Texas and Louisiana should monitor the system closely this week. 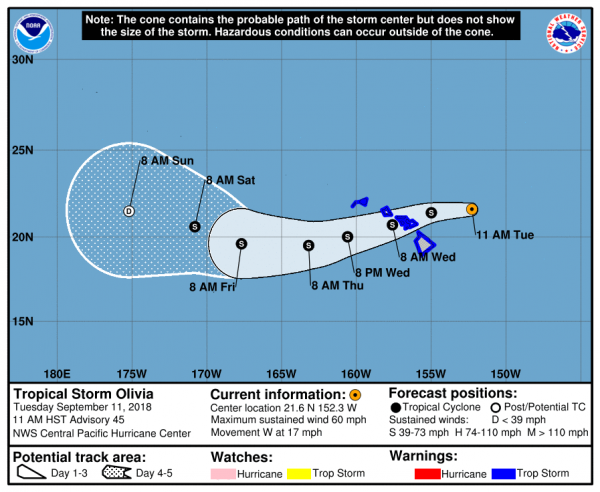 Tropical Storm Olivia. Olivia will work into the Hawaiian islands tonight as it continues to track west. It is expected to turn west-southwest with a direct track through Hawaii into Tomorrow. Maximum sustained winds are near 60 mph with some weakening forecast in the next 48 hours. Regardless, Olivia is expected to maintain its strength as a tropical storm as it impacts Hawaii. Tropical-storm-force winds extend outward up to 90 miles from the center. High terrain on the islands could see very high gusts. Tropical storm conditions are expected tonight for many of the islands. Rainfall between 5 and 10 inches is expected with localized higher amounts of 15 inches possible. Life-threatening flash flooding is possible. Large swells and dangerous surf will be a danger in the next few days, especially along exposed east-facing shores. 83 F. maximum temperature yesterday in the Twin Cities. 74 F. average high on September 11. 82 F. high on September 11, 2017.